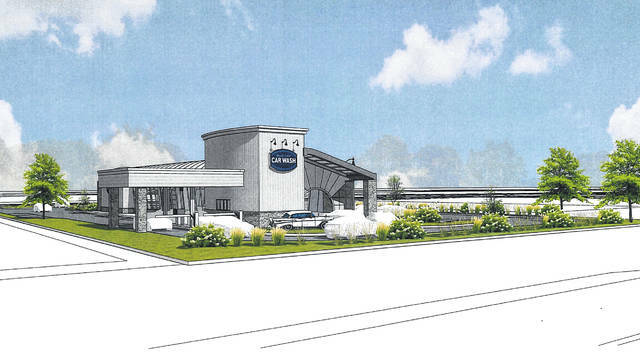 Pictured is a rendering of what the new Blue Sky Car Wash at Coughlin’s Crossing in Delaware will look like once up and running. Delaware City Council approved the final development plan for a Blue Sky Car Wash to be constructed between U.S. Route 23 and Stratford Road, north of Meeker Way. The car wash will be the first building constructed on the much-anticipated Coughlin’s Crossing development. Barry Nutter, who also owns the Blue Sky locations in Lewis Center and Powell, said the Delaware building will be a “major change” from what was constructed in the other two locations, in order to fit the city’s specifications. The building will sit on approximately 1.28 acres, with the car wash’s footprint being around 5,500 square feet. The tunnel for the wash will be about 110 feet. Previously, Nutter said a typical accessory car wash, such as one attached to a gas station, is around 50 feet. “We think it’s a very attractive building and will fit the area very well,” Nutter said of the plan, which went through several rounds of changes before finally being approved by the city. Nutter said the utilization of an “all-belt conveyor” sets Blue Sky apart from other car washes. Typically, the belt pulls a car through the wash tunnel. At Blue Sky, cars ride on top of the belt. He said there is a significant amount of extra costs in order to utilize such a system, but added he believes that’s the direction the car wash industry is heading due to breaking and anti-collision systems on newer cars causing issues with traditional systems. The Delaware location will be the first in Central Ohio to utilize the system, which Nutter said can clean as many as 175 cars per hour, and one of only a few in the entire state. Nutter said the design and configuration of the car wash are based on a patented design from a car wash manufacturer in Michigan. Asked how much water a Blue Sky location will use, Nutter said each car generally uses around 30 gallons of water. He added there is a reclamation system that captures the water to be reused. The car wash is expected to employ 15 workers, most of which will be in part-time positions. A few full-time positions will be available as well.